We’d love your help. 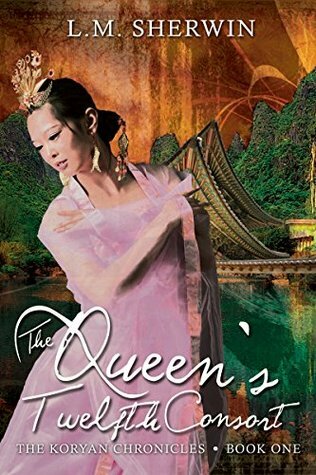 Let us know what’s wrong with this preview of The Queen's Twelfth Consort by L.M. Sherwin. When Han invaders overtake his palace home, the last thing Prince Armstad of Aldiin wants to do is flee the battle to protect himself. Unfortunately, that is exactly what his father, King Amsor, has ordered him to do. In an escape that leaves him wounded and without protection, Armstad rushes into the desert that separates his country from the northern kingdom of Ambul. Th When Han invaders overtake his palace home, the last thing Prince Armstad of Aldiin wants to do is flee the battle to protect himself. Unfortunately, that is exactly what his father, King Amsor, has ordered him to do. In an escape that leaves him wounded and without protection, Armstad rushes into the desert that separates his country from the northern kingdom of Ambul. The Queen of Ambul promises to keep him safe, but her protection is unlike any Armstad expected. As the entire continent is pulled into war with the power-hungry Hans, all Armstad can think about is managing his new life with Queen Eri Sun…and staying alive. To ask other readers questions about The Queen's Twelfth Consort, please sign up. I had read 7 % of the book when I mentally summarized it as "Steampunked Korean history drama on a foreign planet" - and yes, given my love for Korean history dramas, science fiction, and steampunk that's a sure recipe for me to love the plot to pieces (and then some). I still do. It has the right feeling and flow of the history dramas that I mentally added a lot of the tropes and designs seen there, which - at least for me - added to the experience. The additional elements of steampunk technolog I had read 7 % of the book when I mentally summarized it as "Steampunked Korean history drama on a foreign planet" - and yes, given my love for Korean history dramas, science fiction, and steampunk that's a sure recipe for me to love the plot to pieces (and then some). I still do. It has the right feeling and flow of the history dramas that I mentally added a lot of the tropes and designs seen there, which - at least for me - added to the experience. The additional elements of steampunk technology, alchemy, alternative life styles and various religions (or lack thereof) made the plot lovely complex and surprising without too many surprise leaps. Discounting one at the very end, which I hope will be explained in the hopefully soon published sequel. A book I totally intend to get as soon as it's available. The plot truly has me! However, as much as I love the plot, there are a few issues with style and formatting that kept the book from getting a straight five stars rating from me. First, the plot is told in various 3rd person perspectives. A style that I love and that works well in the active, action-filled parts. However, when it comes to the described feelings and internalizations of the characters the inner monologue is rather told. While this is effective for keeping those parts short and the reading speed up, it always separated me from the character, effectively pulling me mentally out of the story. And second, there were a lot of simple typos, the kind of typos a properly used spell checker would have caught, for example switched letters in the character names (Amrstad instead of Armstad, was noticeable often in the first half of the book). L.M. Sherwin is a fantasy novelist by night and an 8-5er by day. She lives with her husband and a parrotlet named "Dovahkiin" in the southeastern United States. A consummate geek, she loves to spend her (limited) freetime reading, gaming, and binge-watching anime and fantasy/sci-fi TV shows.